So, you’re looking for how to buy bitcoin without ID? It’s quite easy once you figure out how to do it. The two options you have is either paying by cash, which, almost never, require any verification and can thus be done privately. The second option you have is to do it by credit card at an exchange as it allows you to buy bitcoin with no id. We get it, buying bitcoin can be confusing and hard to get at first. We’ve all been there. In this tutorial, we will help you buy bitcoins without verification by listing the top options. First, let’s go through the 7 best Bitcoin exchanges that don’t require an ID. After that, we’ll go through the buying process of each exchange so that you can follow along. Oh, before we get into these options – please make sure you have a Bitcoin wallet since some of these exchanges require you to have one. If you need help buying a bitcoin wallet, read our guide to the best bitcoin wallets. What do we have to consider buying Bitcoins without verification? 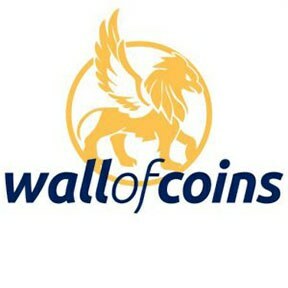 Wall of coins offers a hassle-free process to buy Bitcoins by supporting only cash as a payment method. It is a newly established peer-to-peer exchange based in Florida. Wall of coins accepts three payment methods to buy Bitcoins that include, MoneyGram deposits, cash deposits at various bank branches and Bank of America’s Teller Assist. How to buy Bitcoins with Wall of coins? Well, Wall of coins offers complete privacy to its users. As a buyer, it is not even required to register your account on this site to buy Bitcoins. You can directly pay for your Bitcoins by depositing cash into the seller’s account. The process is simple and is explained below. At first, you have to enter the dollar amount that you are ready to spend on Bitcoins. A list of banks and their branches near you will be displayed once you enter the amount. You have to opt for a bank of your choice and deposit the money into the seller’s account. Once you deposit the cash, text Wall of coins with the proper code. The seller confirms the payment and the Bitcoins are delivered to you within 15 minutes. Wall of coins does not ask for any ID proof. You can directly buy Bitcoins without even registering to the site. Wall of coins maintains good security by offering cold storage to store Bitcoins. The site has implemented a built-in AI (Artificial Intelligence) system that prevents the occurrence of any fraudulent transactions. The site is stringent while holding the Bitcoins at the time of transactions, where it acts as an escrow system. Bitcoins once sent to the site cannot be retrieved. If you want to retrieve your Bitcoins, you will have to contact Customer support representative. Wall of coins does not disclose the transaction fee in public. However, it is said that the fee is quite small (1-2%) along with additional bank charges imposed during deposits. The site has set a minimum limit of $5 for purchasing Bitcoins. Further, traders can set the limit with mutual assent. The transactions are pretty quick. You will receive your Bitcoins within 15 min if the response of the seller is instant. You can check out the site’s FAQ page for your general queries. You can even reach Wall of coins through email or toll-free number. You can also interact with them using the live chat function. Wall of coins strictly maintains user’s privacy and also has a simple user interface. Well, the exchange rates are quite affordable and transactions are pretty fast if the seller responds instantly. Wall of coins should consider displaying transaction fee in public to help users. The time required for delivery of Bitcoins completely depends on the seller’s response. Presently, the site operates in only 12 countries. Signup to wall of coins here! As mentioned above, this site is more of a marketplace than being called as an exchange. LocalBitcoins, a peer-to-peer platform was established in the year 2012 and serves its users across the globe. The site acts as an excellent escrow system by integrating traders to meet and trade along with online trading. LocalBitcoins supports various payment methods such as cash on delivery, cash through the mail, PayPal, WebMoney, Western Union and Wire exchange. How to buy Bitcoins with LocalBitcoins? LocalBitcoins is a decentralized exchange, where users can trade in-person and the site acts as an escrow system. New users who want to get started can register an account on this site by clicking on the sign-up option. Once the account is created (as a buyer), the user can start searching for a seller to buy Bitcoins. Even some advertisement of the sellers with their offers will also be displayed on the site. The buyer can choose an appropriate seller from the list of sellers appeared on the site. After choosing an appropriate seller, the buyer has to enter the amount to buy Bitcoins as well as a payment method. At last, the buyer can complete the process by clicking on “Buy” option. A user has to check the feedback section in seller’s profile before buying Bitcoins. The site upholds the anonymous nature of Bitcoins and does not ask for any verification details. However, some users might ask for your ID proof as per KYC and AML regulations. The site is an efficient and reliable escrow system with an excellent security set up. The has enabled two-factor authentication, encrypted with HTTPS protocol that comes with a Login Guard. Frequent SMS and Email alerts will be sent to the user. The site also has an excellent white hat program, which is a great opportunity for all security researchers. Buyers are free from paying any fee to the site. sellers are charged 1% fee along with Bitcoin network fee by this site. However, sellers are in complete control of customizing the transaction fee, which is a matter of concern for all buyers. Some sellers charge buyers slightly extra fee to cover up the fee levied on them by the site. The buyer and the seller are free to carry out any number of transactions and any amount of transactions. However, traders can apply limit with mutual assent. You can check out the FAQ section of the site to find an answer to your query. For further support, you can contact LocalBitcoins through email, which offers a pretty quick response. LocalBitcoins allows the user to buy Bitcoins without verification and also supports a wide variety of payment methods. The site is easy to work with and also upholds user’s privacy and security. Buyers have to worry about the transaction fee, as sellers are in complete authority to set the transaction fee. Buyers must be careful during in-person trading with the seller from getting robbed. You should definitely consider Bitquick if you are willing to buy Bitcoins with cash deposits without submitting any ID proof. Bitquick acts as an excellent escrow system launched in the year 2013 and operates in 49 US states by supporting three fiat currencies (US dollars, Canadian dollars, Euros). Bitquick supports Bank Transfers, Western Union, MoneyGram and carries out all its transactions using cash deposits. How to buy Bitcoins with Bitquick? As you know, the site offers buying Bitcoins with cash deposits and buyers can get their Bitcoins without even meeting the seller. The process to buy Bitcoins is simple. You can directly head towards buying Bitcoins without registering to the site. The first step is to enter the approximate amount that you are ready to spend on Bitcoins. Next, select the desired order from the order book and enter your email address along with your Bitcoin wallet address. You will receive an email that will contain a link (save the email). later, head towards the bank and deposit the amount into the account number present in the order confirmation page. Next, click a picture of the receipt provided by the bank to the link sent in the email. Once the receipt is received by the seller, you Bitcoins will be released from the escrow and will be delivered to you within 3 hours. Users are not asked to submit any ID proof for trading. Instead, a PIN is created by the seller which allows them to accept, modify or cancel the order.Buyers might be asked to update a photo ID. User’s deposits up to 250,000 are secured using BitGo’s multi-signature wallet that is incorporated by Bitquick. The proof-of-reserve auditing system displays the number of Bitcoins held in the escrow by disclosing the dealings taking place on the exchange itself. Bitquick does not charge any fee on withdrawals. However, 2% fee is levied on the buyer rather than seller like other sites. All the exchange rates are set by the seller with additional bank charges. Bitquick has not set any limits on the transaction. Moreover, traders are allowed to set limits with mutual assent. 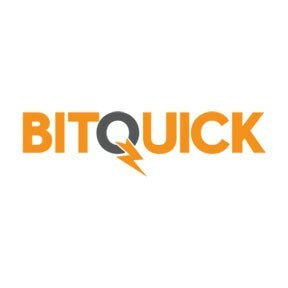 Your Bitcoins will be transferred to your wallet within 3 hours(maximum time) by Bitquick. You can reach out Bitquick’s customer support almost any time. Bitquick is a reputable site with a simple user interface. The services offered by Bitquick are fast and reliable. The is a well-built escrow system. The exchange rates are set by the sellers and might result in charging high. The site operates in only the states of US and supports three few fiat currencies. Coinmama is a credible option even though the site requires some level of verification. The site was launched in the year 2013 and serves over 219 countries and the majority of US states. The site has not yet implemented its wallet and hence Bitcoins are stored in the address provided by you. Currently, Coinmama supports only credit/debit card payment to buy Bitcoins. They have SEPA transfers, which allows you to transfer money from your bank account (Europe). This addition makes coinmama the go-to exchange in Europe. How to buy Bitcoins with Coinmama? The process to buy Bitcoins via Coinmama is explained below. Creating an account on this site is quite simple. verifying your email address is the only criteria to get registered on the site. Next, log in to your account, where you can see a page asking for some details. Once you enter and save your details, you can see an option called “Buy Bitcoin” on the navigation bar. Click on the tab and choose the number of Bitcoins you want to buy. Then, you are asked to select a mode of payment. you can select any mode as per your convenience. If opt for a credit card as a payment mode then the process is simple as well. After selecting credit card as a payment method, add your Bitcoin wallet address and hence you will be asked to enter your Billing information and address. Next, you have to enter your credit card information. You will be asked to verify your phone number and email by sending a 4-digit PIN via SMS. Next step is to upload your ID proof. Please note that you may have to complete a certain level of verification depending on the number of bitcoins you want to buy, the info about which is given below. As mentioned above, Coinmama does not ask any ID verification for transactions up to $150. However, for the users who are willing to buy Bitcoins more than $150 can refer the process below. Level zero – You are asked to update your phone number, ZIP code, state, and city to spend up to $150 on Bitcoin. Level one – you are asked to submit your ID or Driver’s license to spend up to $10,000 on Bitcoin. Level two – You are asked to submit your government issued ID proof along with other ID proofs. users can also submit their submit their passports and hence are open for spending $50,000 on Bitcoin. Level three – This is the highest level of verification, where the user has to update face-to-face recognition approved by a notary or a lawyer and then you can spend up to $1,000,000 on Bitcoin. Coinmama is a reputed site with a good security set up. The site is secured with 256-Bit SSL encryption, which hides all the sensitive data from third parties and hackers. For maximum security, users are advised to set a password that involves uppercase and lowercase letters along with numbers and symbols. Deposit and withdrawal are free of cost but you will be subjected to a regular fee charged by the bank. Apart from other modes of payment, the credit card is the widely accepted payment mode among users. you will be charged a flat fee of 6.75% overall on all the transactions. Adding to this fee additional 5% fee is applied to all the credit cards. The fee will be automatically added after the payment mode is entered. This automatic credit card transaction is carried out by a processor called Simplex. Credit card transactions are limited up to 5000 USD/EUR per day and 20,000 USD/EUR per month. Coinmama has a simple user-friendly interface by supporting credit card payments, which some other platforms do not support. Users get an advantage of buying Bitcoins up to $150 without any verification. The site also offers an excellent referral program. 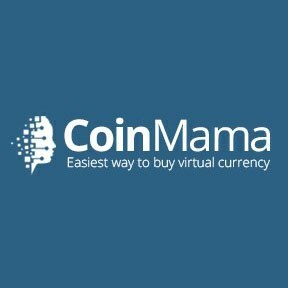 Coinmama does not allow you to sell Bitcoins and also fails to upgrade the site frequently. Bitit is a Paris based Bitcoin exchange platform operates only in Europe by offering 3D secure credit/debit cards and cash using Neosurf, Flexepin, and Cashlib prepaid vouchers as payment methods. You can buy Bitcoins from local vendors through Bitit. Bitit offers buying Bitcoins from your local vendors using Neosurf, Flexepin and Cashlib vouchers. You can buy Bitcoins online using credit/debit card, Trustpay Bank transfer and ePay wallet. How to buy Bitcoins with Bitit? Create an account by registering to the site by filling some basic information. 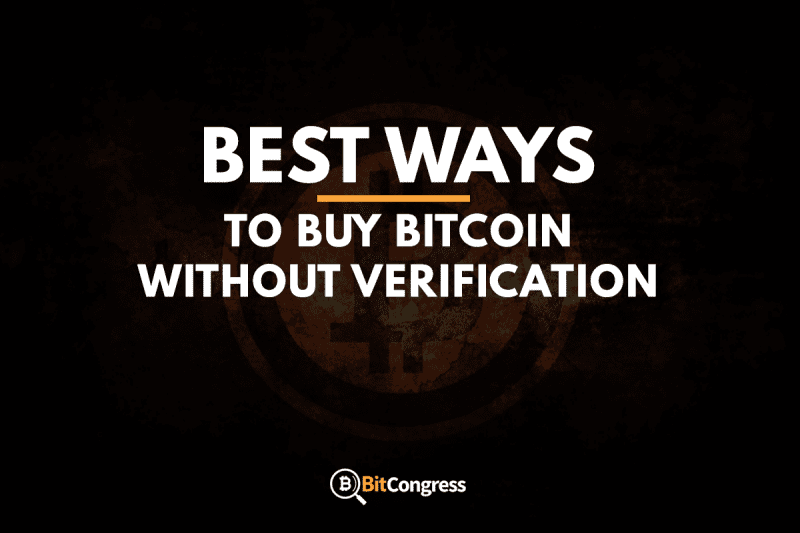 You can quickly buy Bitcoins up to EUR 25 without any verification. Next, place an order by entering the number of Bitcoins you want to buy from EUR 25 to EUR 250. Choose a payment method (3D secure credit/debit cards, Neosurf, Flexepin, Cashlib vouchers, Bank transfer, Epay e-wallet) to pay for your Bitcoins. Once the payment is made, your Bitcoins will be delivered to your Bitcoin wallet address within 10 minutes. No ID proof is required to buy Bitcoins up to EUR 25 once you have registered on the site. Moreover, for users who want to buy Bitcoins more than EUR 25 will have to submit ID proof along with a selfie by holding the proof. Bitit has many store locations in France and maintains a constant social media presence, which means that the site is legit. The site is encrypted and maintains all other security measures similar to the sites which offer credit card payment do. The transaction fee completely depends on the mode of payment. Buying Bitcoins using credit/debit card will cost you 3.9% fee on all the online transactions and a fee of 8.9% to 10% will be charged for using Neosurf, Flexepin and Cashlib vouchers. Additional to this fee, a foreign exchange fee might be charged on the credit cards. Some sellers might charge you extra for vouchers when you buy it from the stores. There is a limit to buy Bitcoins up to EUR 50/7 days without any verification and also pre-order limits EUR 25 to EUR 250 imposed by the site. Traders are free to place any number of orders. The time required to receive Bitcoins depends on the Bitcoin network. The exchange has a rich Knowledge Base section along with email support system. You can even contact Bitit through their social media page. It is very easy to buy Bitcoins using Bitit. Moreover, you are not asked for any verification details for orders up to EUR 25. The site applies a limit on the transaction. The exchange rate fee is quite lofty. Did you ever imagine buying Bitcoins would be as simple as withdrawing cash from ATM! well, there are over 30 Bitcoin ATMs with more than 20 manufacturers today that offer buying Bitcoins without submitting any ID proofs. To mention, Genesis machine1 (from Genesis coin), Satoshi1 or Satoshi2 machine (from Genesis coin), Lamassu, General Bytes BATMTwo (one-way), General Bytes BATMThree (two-way), BitAccess are some of the popular Bitcoin ATMs. How to buy Bitcoins from Bitcoin ATMs? Bitcoin ATM map will guide you to the nearest Bitcoin ATM. The Process is like this. You head towards a Bitcoin ATM and scan the QR code of your Bitcoin wallet address. You will receive your Bitcoins at this address itself. In some cases, the machine will generate a paper wallet. Next, you might be asked to Scan your fingerprint or any other verification that completely depends on the configuration of the ATM machines and it differs with different manufacturers. Next step is to enter the number of Bitcoins you want to purchase (you can also enter the amount of fiat currency you want to spend). At last, you have to insert the cash and wait for few seconds until your Bitcoins are delivered to your Bitcoin wallet address. You will be charged 5% to 10% fee by ATMs, but users are ready to pay that fee, as it provides complete privacy. The limits on the transaction differ with different manufacturers. Buying Bitcoins from the Bitcoin ATM is the most simple and reliable method. User’s privacy is preserved. The transaction fee is quite lofty. BitFinex allows users to buy bitcoins with credit card and no verification, using ShapeShift. The only criteria to buy Bitcoins using ShapeShift is to deposit any Cryptocurrency, i.e you will have to deposit altcoins or any other digital tokens in order to buy Bitcoins using ShapeShift. This is the best site for traders who are indulged in trading one cryptocurrency in exchange for other. How to buy Bitcoins using ShapeShift? The process is simple. You will have to trade any other digital token in exchange for Bitcoins. To start off, go to the shapeshift.io site, where a box will be displayed with various coins. Select a coin initially that you want to buy followed by other coins that you want to deposit. For example, if you are depositing Litecoins for Bitcoins, then Litecoins should show under “deposits” and Bitcoins under “receive”. Then click on “continue” where you will be directed to a page asking you to enter Bitcoin wallet address along with Litecoin refund address (in case the transactions are not successful). At last, complete the transaction by clicking on “start transaction” and send the number of Litecoins in exchange for Bitcoins. Some sites take a long time to verify user details. If you want to buy Bitcoins in short duration of time or instantly (which some sites/exchanges offer), you can opt for buying Bitcoins without undergoing any verification process. Some users will not be willing to Buy Bitcoins if there is a need to upload their ID proofs. It is because of the risk of exchanges being hacked. However, the sites ensure good security, but it depends on the user’s trust on exchanges. Well, buying bitcoins without any verification provides high a degree of privacy which some users prefer. Although Bitcoin wallets and exchange sites ensure excellent security, it is always preferred to store your Bitcoins in a hard wallet or a paper wallet. There are various hard wallets such as Ledger Nano S, TREZOR, KeepKey and much more that can be considered for storing your Bitcoins. Moreover, users must check the sites and feedback section before buying Bitcoins. Most of the people prefer buying Bitcoins without submitting their ID proofs. 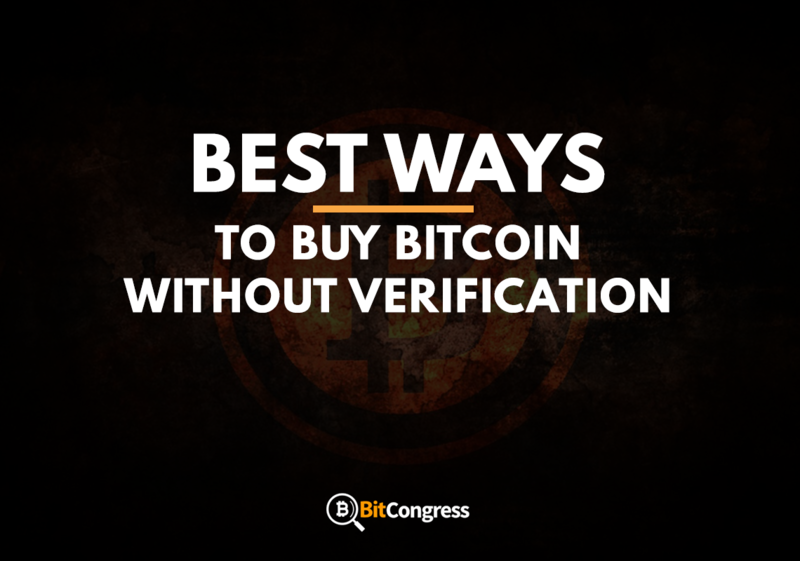 Purchasing Bitcoins without any verification comes with many advantages. These kind of transactions are quite quick and reduces the risk of updating your bank details on the site. While some exchanges support online transactions, other platforms such as Bitcoin ATMs are physical sites which are preferred by most of the users as it offers complete anonymity. There are some sites such as Bitit which offer purchasing Bitcoins using vouchers, which is really cool. Users who are willing to buy Bitcoins in-person can rely on LocalBitcoins and others who prefer purchasing Bitcoins with cash deposits and credit cards can consider Wall of coins, Bitquick and Coinmama. I hope you had a good read and this guide helped you with the process of buying Bitcoins without verification. Then jump right into it and get yourself some Bitcoins.